Minihost Modular (Free) – You’ll have to register for an account to see the download link in the forums. This guide is an expansion of Rhinehold’s Voicemeeter Banana setup guide. Make sure to check that out for setting up Voicemeeter Banana, an awesome virtual mixer. The main reason I decided to get a virtual audio mixer was to properly setup a compressor for my Razer Seiren microphone (USB). However, I found the compressor tool for Voicemeeter Banana to be a bit lackluster for my needs. The higher I raised the compressor, the more background noise was being picked up and my voice quality decreased. I needed something a bit more advanced but nothing overly complicated; I am far from being an audio expert. Hopefully this guide can help others improve their audio quality in their stream with some awesome free software! Setup Voicemeeter Banana using Rhinehold’s guide. 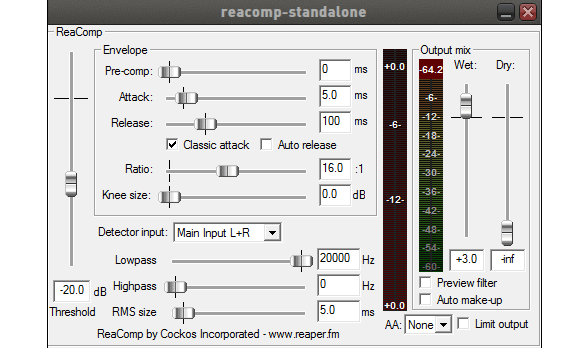 Install Minihost Modular and Reaper ReaPlugs. In Voicemeeter Banana: Menu -> System Settings/Options. At the bottom where it says ‘Patch Insert’, make sure “in1 Left” and “in1 Right” are turned on by simply clicking on the boxes. 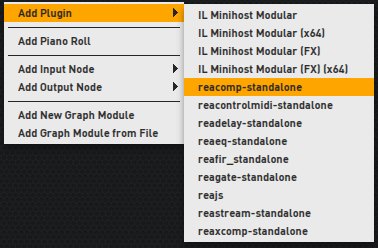 Note: There is another plugin called reaxcomp-standalone. 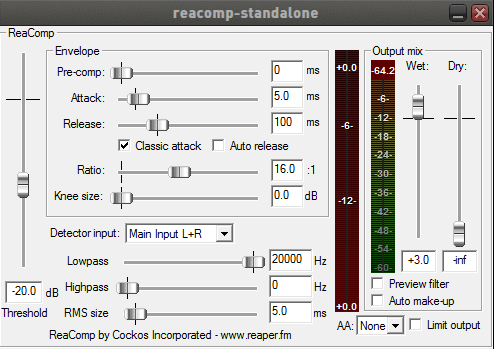 This guide uses reacomp, but for advanced users feel free to check out reaxcomp. Connect the left yellow node to the top left yellow dot on the program, and the right yellow dot to the right yellow node as pictured below. A new window will appear. This is where you will configure and fine tune your compressor settings. I recommend getting a friend to listen over a voice communication program to help you easily test out the settings. Make sure you’ve changed your microphone output to Voicemeeter Output on whatever program you use for testing, otherwise your friend won’t hear the changes! Threshold: In dB, is the audio level where the compressor will start to work. For a calm voice-over or commentary usually between -4 and -6 is a good starting point. The more dynamic your audio signal has (for example switching between normal talking and loud screams), the lower you might want to set the threshold down to -20 and below. If set too low, you might end up increasing the noise. Ratio: Determines by how much the signals that are over the threshold will be reduced. For example: 1:1 = no compression. 2:1 = For every 2 dB of the input signal that is over the threshold, only 1 dB will reach the output. Pre-comp: In ms, can be set so that the compression starts by the amount before the input signal reaches over the threshold. Attack: In ms, determines how fast the compressor starts to work. The lower the better for short audio signals like drums, single claps etc. If set too small, can cause unwanted noises. If set to high short audio peaks might get through uncompressed.Release: In ms, determines how long the compressor keeps working after the input signal does not go over the threshold anymore.Knee size: Can be used to reduce the hard impact of the compressor if noticeable. Starts the compression with the set amount and gradually increases until the compressor fully works. Detector Input: Determines which signal the threshold references to apply your settings to your input signal. Default is your own input signal. If you’re not sure what this does, leave it on default. Lowpass: Frequencies above this value will not be affected by the detector input and therefore not by the compressor. Highpass: Frequencies below this value will not be affected by the detector input and therefore not by the compressor. Combine Lowpass and Highpass to set a certain bandwidth in between both values that the compressor will affect. RMS size: In ms, keep at 0 ms for the compressor to fully work based on the peeks of your signal. Increase to reduce the work of the compressor. Wet: Stands for your compressed output signal. You can increase it to compensate for the reduced peeks. This gives your signal the effect of more density. Dry: Is your uncompressed input signal. You can mix it with your compressed signal to increase the density too or simply bring back some more of the dynamic range. The two main settings you want to focus on for basic compression are Threshold and Ratio. I can yell pretty loud when streaming, especially when playing Dark Souls, so I turned my ratio up to 16:0 to really make sure I won’t break anyone’s ears if I yell into the microphone. Play around with these two settings so that your sound is properly compressed without too much distortion. You’re going to have to do quite a bit of yelling into your friend’s ears (sorry friend!) until the loudest you get (or rather, the loudest you typically get during your streams) sounds at about the same level as when you’re normally talking. It’s possible your microphone is going to be more sensitive to background noises when you talk now. Luckily, a plugin you’ve already downloaded with ReaPlugs called reafir_standalone can easily clean that up. Check out our guide for removing background noise with Minihost Modular. Thanks to @AndreBauscher for helping define some technical audio terms. Having trouble with this guide? Talk to us in the StreamerSquare Discord or our forums. Is there any way to save these settings so I don’t have to redo this every time I start up? I closed them and it didn’t save my settings and I will have to redo everything. Yes! You’ll want to go to File -> Save Graph As and you’ll be able to load it with “Open Graph”.